Tabletop cookie depositor with 3D functionality! The day of the extensively equipped confectionery device that is perfect for small enterprises, has finally arrived! So whether you are a small scale confectionery business, a food and beverage outlet, hotel, cafe or restaurant, our innovative baking equipment is here to help. Have you always yearned to serve your customers your own cookies but have been been hindered by limited facilities and could not justify the cost of a qualified trades-person? Well, thanks to ENIGMA, the world's leading manufacturer of confectionery equipment, your dream can be fulfilled. Our revolutionary tabletop automatic cookie depositor has the ability to replace the skill of the human hand. Owing to its compact design, the ENIGMA M400S 3D tabletop automatic cookie depositor enables small scale production whilst eliminating the need for extensive facilities. Able to function on any work surface, it extrudes cookies from any of the dough types used by industrial confectionery machines. It is the perfect solution to all those who value a high-quality, diversified range without needing to produce on an industrial scale. It is a truly trendsetting device because, in addition to its capacity to produce all standard cookies, it has the ability to shape dough in 3D. Thanks to this unique feature, it is possible for this cookie-making machine to extrude items in the form of geometrical figures, a logo and other designs which could previously have only been done by a skilled pair of hands. The ENIGMA M400S 3D is the first compact tabletop automatic cookie depositor that makes possible the production of cookies from doughs that are normally difficult to work with, such as those with large pieces of chocolate or almonds. It can be equipped with a strip for shutter dough-cutting in order to enable this function. In addition, the production of variously sized beignet rolls, peas, sponge cake bottoms and large and small eclairs is possible. The machine comes with the additional function of “pneumatic wire-cutting”, a feature which not only expands the product range but also improves overall efficiency. The application of this unique feature eliminates the “bun” effect as all cookies that are wire-cut are perfectly uniform and, as with a roller machine, evenly deposited onto the tray. A unique and revolutionary feature of the 3D tabletop depositor is its ability to create a mind-boggling assortment of shapes. These include: graphic symbols, letters, geometric designs and many others. The M400S, equipped with its ground-breaking design and wide range of tips and head dies, will give the producer an almost unlimited range of product. The use of the CNC motors in the ENIGMA M400S 3D tabletop depositor ensures extremely precise control during cookie formation, to the extent that the machine effectively replaces the hand of a skilled confectioner using manual extrusion techniques. This is of vital importance to confectionery businesses that previously had to rely on manual extrusion using a pastry bag. Additionally, the advanced extrusion heads do not damage sensitive dough structure and they improves the machine's operational speed and efficiency. The ENIGMA M400S 3D is currently the quickest and most accurate machine of its type in Europe, (and the world) and has been approved by most confectionery production experts. 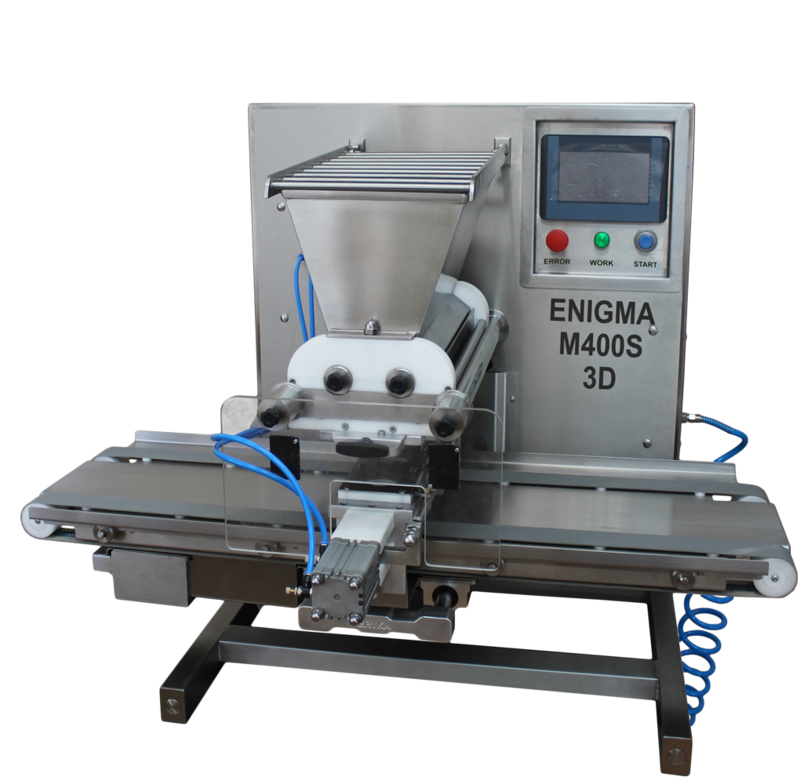 This company's esthetically designed ENIGMA M400S 3D tabletop cookie depositor is characterized by a very high manufacturing standard. The conveniently designed controls make operation an easy and enjoyable experience. To comply with local and international hygiene requirements, the entire machine has been designed in order to make routine disassembly and essential cleaning a simple matter. This easy to use facility makes conforming to local hygiene regulations a simple matter. Naturally, our machine fully protects the operator and also incorporates an integrated system which prohibits unauthorised use. When manufacturing our machines, we follow up to the minute global trends in design and ergonomics and we use only tried and tested materials from leading producers. The combination of the very high production capacity of the ENIGMA M400S 3D and its affordable price ensure that our product is highly competitive with those of other manufacturers within the European Union and elsewhere in the world.